Boka. Well-off older people in Old Town and Lincoln Park have a new clubhouse and its name is Boka. 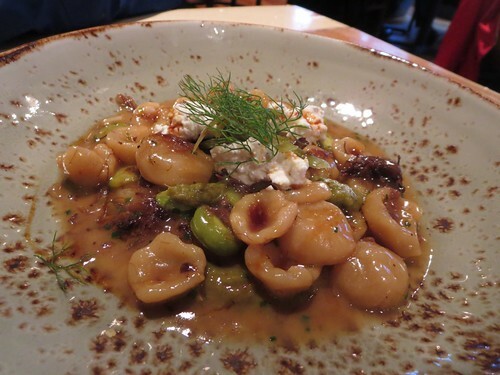 Some might find a disconnect between Lee Wolen’s artful, slightly precious food and the more hipster room, which has the funky Tim Burtonesque touches of another Boka Group spot, Girl & The Goat. 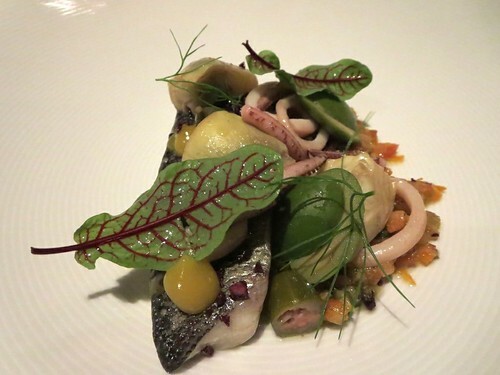 But a packed, silver-haired Boka on a Saturday might be an argument that coherence is overrated; Avec has always had a disconnect for me between Italian-German comfort food and its severe Swedish sauna decor (and lack of comfort), and it’s taken that disconnect all the way to the bank. 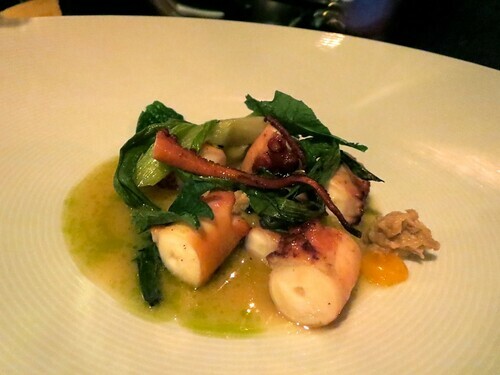 I suspect Boka will too, for a long time to come. Homestead. The rooftop restaurant above Roots Handmade Pizza has promoted its previous #2, Chip Davies. The menu still looks a lot like Chris Curren’s, with some dishes carried over or evolved, but what I liked best was the new spin Davis brought to many of the dishes, of middle-eastern flavors and ingredients such as green almonds (which could have been favas if I hadn’t been told). The middle-eastern tinge gives Homestead something distinctive to hold onto as it otherwise serves up nicely comfy kind-of-rustic-Italian dishes like the orecchiete with smoked oxtails, or roasts a chicken but puts it in a tagine broth with golden raisins, which you might see anywhere otherwise. If we ever have a nice day and people can sit on its patio, it will be exactly the sort of unpretentious summer neighborhood restaurant experience that everyone hopes for in Chicago. 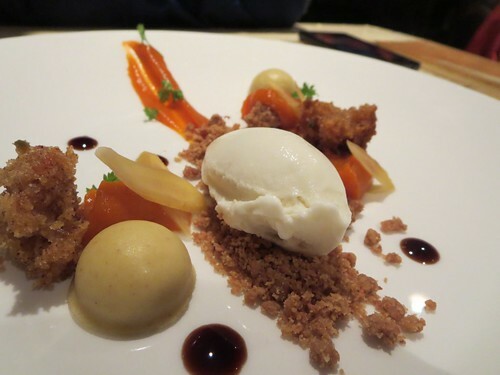 Chris Teixeira’s desserts seem a bit too fancy for the room, but hey, disconnects and all that; I admire that he keeps the sweetness damped down and the combination of a chocolate one and a carrot one, after the rustic food, was pretty great. Disclosure: this was a media dinner, which my son and I attended. Les Miserables. As long as I’m disclosing, the same son and I went as guests on opening night to Drury Lane’s new production of Les Miserables, after seeing the movie some months back. 20 years ago, I saw it at the Auditorium Theater, from about six blocks away it felt like, and watching the famous revolving stage moving from that distance had all the excitement of watching a chair swivel. Better seats and a more intimate production made this a far more satisfying experience, a thoroughly professional one (led by a Valjean, Ivan Rutherford, who had been in the Broadway production’s long run and done it 2000 times around the country by now, and is, shall we say, very comfortable in the role), where the focus was on the actors over the (handsome but not overly expensive) setting. The slickly pro cast had two particular standouts, Mark David Kaplan giving the rogue Thenardier more humor and rascally charm than Sasha Baron Cohen’s muggy performance in the movie, and the one major example of race-neutral casting, Quentin Earl Darrington as a most ominous Javert, a regular Darth Javert in stentorian James Earl Jones-tones that set Javert even more apart from the citizens in the story. Isla Pilipina. I went to Isla Pilipina in a rather memorably titled LTH post many years ago, but hadn’t returned until almost a decade later when we went with some friends, who had just visited the Phillippines. 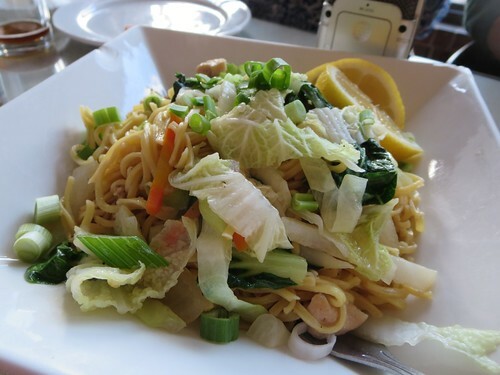 Anyway, it is a very different place a decade later, much more professional in the manner of any well-run, well-packaged Asian restaurant, and packed on Saturday night. We ordered tons of food (with kids, there were eight of us), including two 20-piece orders of lumpia (devoured almost entirely by the kids), funky kare-kare (oxtail and green beans in peanut sauce), lechon kawali (deep-fried pork belly with a kind of gravy), fried chicken, grilled sirloin with a Filipino marinade tinge, garlic rice, pancit noodles and more (the spaghetti with hot dogs in it, which the kids were enthused about based on description, came late and went untouched, alas). Anyway, suffice it to say that it will not be another 10 years, and Isla Pilipina quickly zoomed to where it should have been all along on my list of Asian neighborhood gems. Paco’s Tacos. 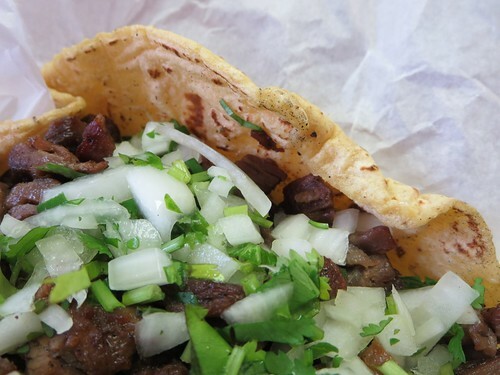 When I put Zacatacos on a Thrillist list of south side places, several people suggested Paco’s Tacos instead. But a year or so ago, for a Grub Street list, I had tried the two back to back and it was no contest. 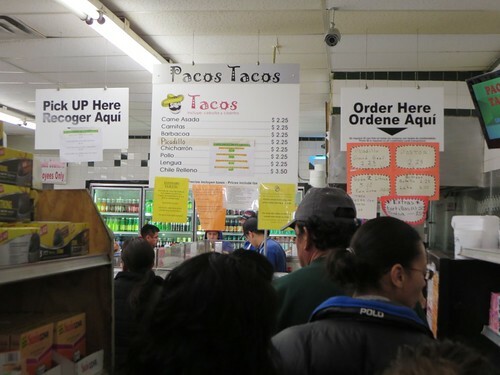 Titus of Tweets of Taco said, you need to go to the original Paco’s, inside a supermercado. So I gave it a try. We stood in a good-sized line. A guy behind us seemed to be talking legal advice for his crew on his cellphone, or maybe that was our recent Breaking Bad-viewing coloring the conversation. We got our tacos. 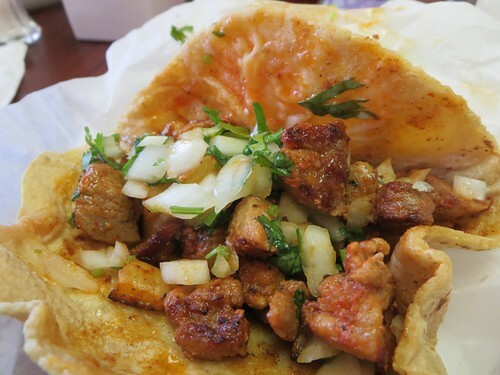 He’s right, these are much better than other Paco’s, and rank highly among south side steak tacos. Still think I’d pick Zacatacos first, but always worth knowing another one. 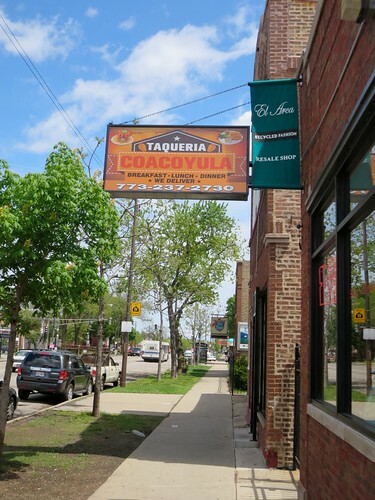 Taqueria Coacoyula. I spotted this place driving down Fullerton and thought it said it offered breakfast tacos, which would be a great find if true (and good). I must have conflated the signage, which does reference breakfast on weekends but not tacos. Still, I gave it a try at lunch, paying 50 cents extra for hand made tortillas. And I would still rate it a find, making very satisfying salty steak tacos in chewy, delectable freshmade tortillas, and doing a nice job on pastor tacos even without a cone (but lots of pineapple tossed in). That stretch of Fullerton (Austin to Cicero or so) is full of good things worth exploring, including this steak place, this modest comida, the tacos de canasta at La Chilangueada and more. Detroit Kabob House. Cathy Lambrecht and my kids and I tried to go here once after she did a canning demo for their 4-H chapter, and they chased us out 15 minutes before closing. But we tried again at lunch recently and got a decidedly better welcome, and I’m glad we went back. They don’t use charcoal like some of the Bridgeview-area middle eastern places (or ones in Detroit, that is, Dearborn), but even on gas grill, they did a terrific job grilling kebobs and other meats. 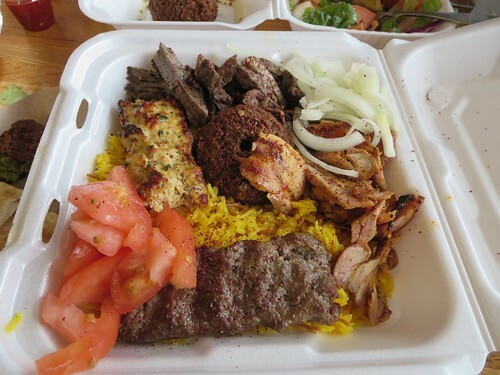 I was less excited by the sides— baba ghanoush was fine, Jerusalem salad kind of a mess— but it’s a definite stop along the Niles stretch of Milwaukee for some simply, expertly grilled meats. I wish I had known you were heading to Isla Pilipina. Isla is one of my favorite restaurants in Chicago, and I don’t get there often enough because of my on going battle with cholesterol and trigs. I absolutely love the place. Off topic: If you ever get the chance, swing up to my neighborhood in Edison Park and try my favorite Italian bakery- Conca D’Oro, specifically around 11:00AM on any given Saturday afternoon. The owner, Julia, makes all her homemade goodies every Saturday, but the food is gone by mid afternoon. She brings everything out on various trays at room temperature. Try her chicken with olives, vesuvio potatoes, broccoli pasta, and her sausage and peppers. It’s all outstanding, and her cannoli’s are the best in the business. She makes true, authentic cannoli’s- not the Americanized versions with nuts and chocolate chips- just the plain cannoli filling. She’s a one woman show- everything is done by her. Sometimes, she gets a little help from her granddaughter or a relative for serving purposes, but all the cooking is done by her only. She doesn’t always make her cannoli’s but when she does, they are truly the best in the business. The whole place is very old school Sicilian. My wife’s from Elmwood Park so it reminds her of home. And I still love Armand’s down the block for pizza- not by the slice, but their regular Chicago style thin crust, cut into squares, with homemade Italian sausage. The new Armand’s doesn’t have the original Elmwood Park Grand Ave. ambiance (and definitely not the “history” either), but the recipe is EXACTLY the same. Good stuff. I loved your article about thin crust pizza and Italian beef, too. Johnnie’s in Elmwood Park will always be my all time favorite. They are the Wrigley Field of all Italian beef joints, and the gold standard for all other beef joints. Much like my other childhood favorite for hot dogs- Gene and Jude’s. Nothing compares. Chicago style thin crust pizza, cut into squares, with homemade Italian sausage is a little more complicated for me. If were talking going back to childhood, then Villa Nova in Stickney definitely wins out. But, boy oh boy- Pizano’s thin buttercrust with sausage sure gives “The Nov” a run for its’ money. I still love Armand’s, too. The one thing all 3 places have in common- homemade Italian sausage. But you can never go wrong with Pat’s, Pizza Castle, or Candlelite, either. And I’m eagerly awaiting the opening of the new Joe’s Italian Villa, formerly of Bridgeview for the last 50 something years. They will be re-opening at their “new” location very soon, so residents of Chicago’s Clearing, Garfield Ridge, and Scottsdale neighborhoods will be very happy to see their old homemade sausage powerhouse return to prominence. Joe’s Italian Villa was a true neighborhood fixture for many, many years. On any given night it was always packed with families, city workers with their families, and everybody in between. A true blue collar spot. I hope the new version has the same South Suburban ambiance. I’ve seen Conca d’Oro but I thought it was a Mexican bakery which is usually not a recommendation, even in Mexico (Bombon excepted). I’ll check it out. Armand’s, like Marie’s, came close to being on the list, but in the end I decided it wasn’t distinctive enough to recommend long travel. But I order Armand’s from the Western outlet frequently. Good to hear from you here.